The College of Physicians of Philadelphia Digital Library | Denotat brachium infantis in liquore conservatum, in cujus manu continetur ovum foecundatum testudinis marina. Denotat brachium infantis in liquore conservatum, in cujus manu continetur ovum foecundatum testudinis marina. 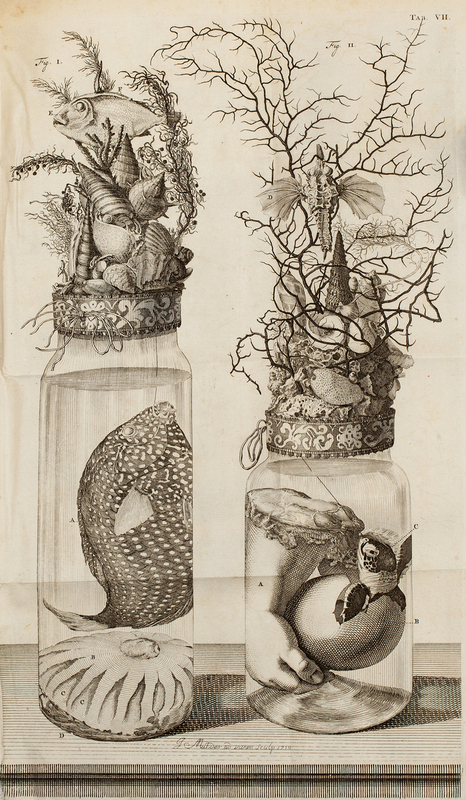 Engraved by J. Mulder from a specimen by Frederik Ruysch. A specimen jar with the severed arm on a human infant holding the egg of a sea turtle, the hatchling of which is popping it's head out (fig. 2); in the adjacent jar, a spotted 'Zeylanicus' fish and sea-nettles (fig. 2). Each jar is top with sea plants, shells and other marine life. Mulder, Joseph, 1659 or 1660- and Ruysch, Frederik, 1638-1731, “Denotat brachium infantis in liquore conservatum, in cujus manu continetur ovum foecundatum testudinis marina.,” The College of Physicians of Philadelphia Digital Library, accessed April 24, 2019, https://www.cppdigitallibrary.org/items/show/1505.